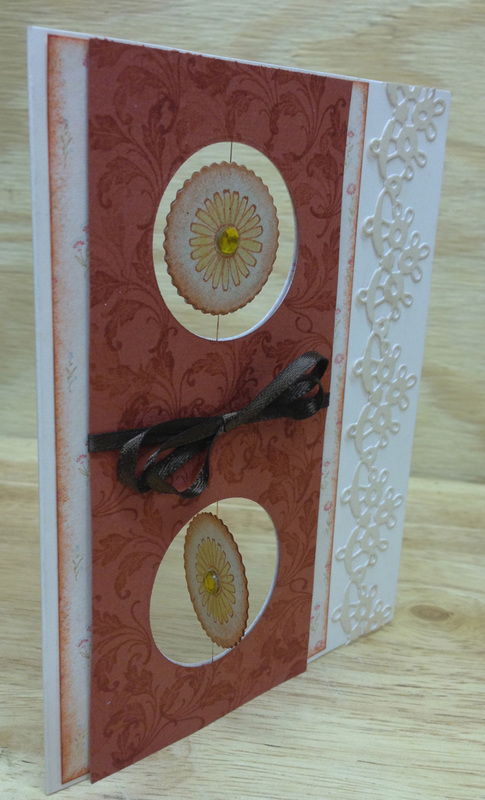 Use the Little Stackers Classic Circles to cut openings in each layer (the card stock, patterned paper and your card). 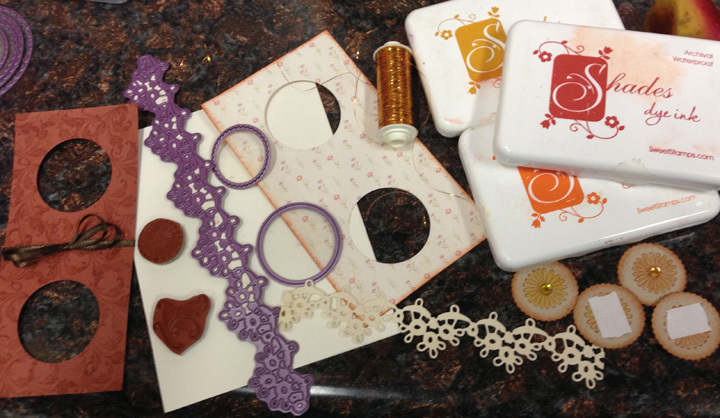 Use the Little Stackers Scallop Circles to cut a front and back for each suspended piece. I have two suspended objects, so I cut four total scallop circles from the Fossil CS. Stamp Firewheel Flower small in Rustic ink onto each Fossil layer. Color using Orange and Butterscotch inks and a Dove Blender Pen. Sponge layers with Rustic ink and adorn the center of the flowers with rhinestones. Oops, I forgot to take a picture of the opposite side of the colored CS (it is shown in the supply photo above), but I stamped a Decorative Element in Rustic ink to create a pattern and made a bow that runs across the middle of the two suspension windows. Lay Super Sticky Tape at the top, middle and bottom and tape metallic thread down the center. In each window, place a colored flower to the front and back so no matter which way it spins, there will be a pretty flower to look at. 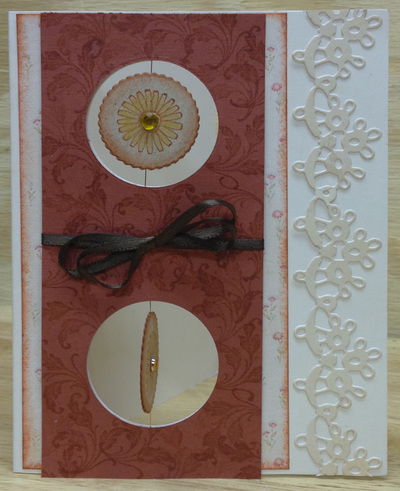 Adhere the Dancing Doily Lace Border to the right side of the A2 cream card and here's a look of the finished suspension card! Try different shaped openings like some of our DT Sweeties did on the cards in the slideshow at the top of this page.